Background: Carnitine-acylcarnitine translocase (CACT) deficiency is a rare autosomal recessive disease in the mitochondrial transport of long-chain fatty acids. Despite early diagnosis and treatment, the disease still has a high mortality rate. Methods: Clinical symptoms, long-term follow-up, and biochemical and molecular results of four cases are described and compared with the reviewed literature data of 55 cases. 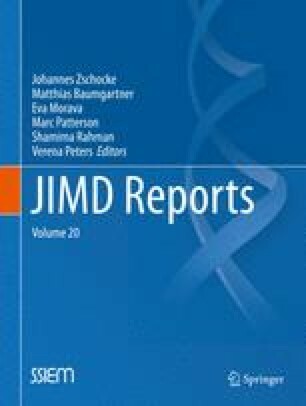 Results: Two cases with neonatal onset, carrying in homozygosity the novel variant sequences p.Gly20Asp (c.59G>A) and p.Arg179Gly (c.536A>G), died during an intercurrent infectious process in the first year of life despite adequate dietetic treatment (frequent feeding, high-carbohydrate/low-fat diet, MCT, carnitine). The other two cases, one with infantile onset and the other diagnosed in the newborn period after a previous affected sibling, show excellent development at 4 and 16 years of age under treatment. The review shows that the most frequent presenting symptoms of CACT deficiency are hypoketotic hypoglycemia, hyperammonemia, hepatomegaly, cardiomyopathy and/or arrhythmia, and respiratory distress. The onset of symptoms is predominantly neonatal in 82% and infantile in 18%. The mortality rate is high (65%), most in the first year of life due to myocardiopathy or sudden death. Outcomes seem to correlate better with the absence of cardiac disease and with a higher long-chain fatty acid oxidation rate in cultured fibroblasts than with residual enzyme activity. Conclusion: Diagnosis before the occurrence of clinical symptoms by tandem MS–MS and very early therapeutic intervention together with good dietary compliance could lead to a better prognosis, especially in milder clinical cases. The authors would like to thank the families for giving their consent. We are grateful to Dr. Nerea Gorria from Hospital General Yagüe in Burgos for supplying the first clinical data from case 3. We gratefully acknowledge the funding by Mitolab (S2010/BMD-2402) DGUI Comunidad de Madrid. Long-term clinical outcome in carnitine-acylcarnitine translocase deficiency seems to be better in those cases with a very early therapeutic intervention and a good dietary compliance with diet. I Vitoria, E Martín-Hernández, L Peña-Quintana, M Bueno, P Quijada-Fraile, J Dalmau, S Molina-Marrero, B Pérez, and B Merinero declare that they have no conflict of interest.